“Marie” a veteran from Salt Lake City, suffers from post-traumatic stress disorder. 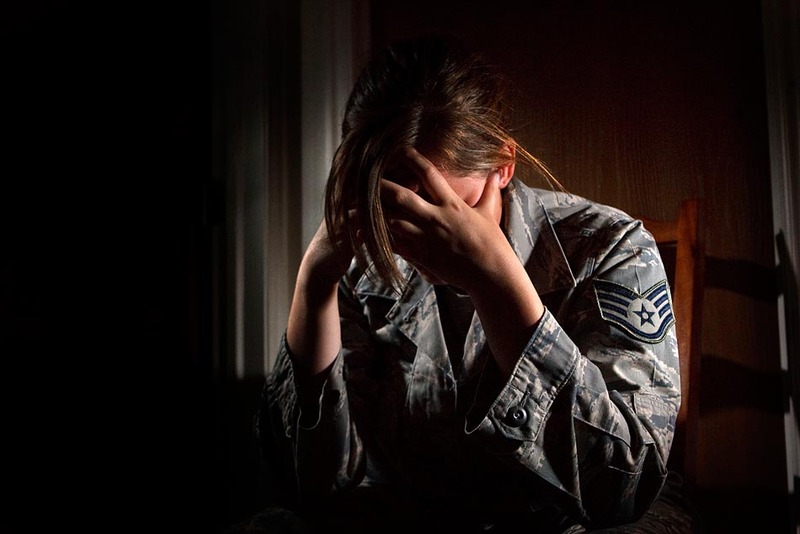 She is among thousands of women struggling to get appropriate mental health treatment at the Veteran Administration. IV Ketamine has shown to be rapidly effective in treating PTSD in a recent study conducted by Emory University. In the first day after treatment, mean scores on the Impact of Event Scale-Revised (IES-R) fell to 14 from 46 at baseline following the IV ketamine infusion, whereas IV midazolam given to the same patients in the crossover trial led to a drop in IES-R scores from 48 to 25. The larger decline with ketamine versus midazolam was statistically significant, despite the small number of patients (29) who received both drugs, according to Adriana Feder, MD, of Icahn School of Medicine at Mt. Sinai in New York City, and colleagues writing in JAMA Psychiatry. Patients with moderate to severe post-traumatic stress disorder (PTSD) symptoms showed rapid and substantial relief with a single intravenous dose of ketamine in a pilot randomized trial. Note that dissociative symptoms were the main psychiatric adverse effects associated with ketamine, which peaked 40 minutes after dosing and were no longer detectable at the 2-hour mark. Barbara Rothbaum, PhD, head of Emory University’s trauma and anxiety recovery program in Atlanta, told MedPage Today in an email that the study breaks new ground in PTSD treatment. “Ketamine has been shown to be helpful for depression and obsessive compulsive disorder, but this is the first time it has been shown to be helpful for PTSD,” said Rothbaum, who was not involved with the study. Others in this field agreed that it was an important finding with strong clinical promise. Steven Garlow, MD, also at Emory, said the drug, which is used a surgical anesthetic, is quite safe. “Midazolam and other sedative type agents represent greater physiological risk than does ketamine,” he told MedPage Today in an email. At the doses used in these psychiatric applications, Garlow said, the drug’s dissociative effects — which have led ketamine to become a drug of abuse — are not a serious problem. Garlow said his clinic had been treating depressed patients with ketamine on “weekly, biweekly, and triweekly” infusion schedules with good outcomes in about half the patients. The main obstacle has been necessity for frequent clinic visits to receive the IV treatments. “The strong responders typically will invest in the weekly or biweekly inconvenience,” he said. For the study, Feder and colleagues screened 57 adult patients and enrolled 41. Patients had to meet DSM-IV criteria for PTSD and score at least 50 on the Clinician-Administered PTSD Scale (CAPS) to be eligible. Patients with any history of psychotic or bipolar disorders were excluded, as were those with recent histories of alcohol misuse. Current anorexia or bulimia, any type of unstable mental illness, and current psychotropic medication use were exclusion criteria as well. Participants were randomized to receive a single IV infusion of either 0.5 mg/kg of ketamine or 0.045 mg/kg of midazolam and were tested repeatedly over the next week. Two weeks after the first infusion, patients received an infusion of the other agent and were followed for another week. Six patients did not receive the second infusion because they still showed sustained improvement of PTSD symptoms from the first dose, the researchers indicated. Four other patients left the study after the first dose: one because of delayed-onset sedation following ketamine infusion, one because of low baseline PTSD symptoms at the time of midazolam infusion, and two for administrative reasons. Both drugs produced sharp drops in IES-R scores after the first infusion, but ketamine‘s was sharper — by 12.7 points (95% CI 2.5-22.8). The difference was slightly smaller at 8.6 points (95% CI 0.9-16.2) after the second infusion. Reductions were seen in all three domains of the IES-R: intrusion, avoidance, and hyperarousal. The advantage of ketamine over midazolam was similar across all three, the researchers reported. By day two after the infusions, IES-R scores began to rebound. However, at day seven, mean scores across the two infusions were still substantially lower than at baseline for both drugs (midazolam 33, ketamine 27). Depression scores on the Montgomery-Asberg scale followed a roughly similar pattern, with an approximate 12-point drop during the first day with both drugs, from a baseline of about 22. Scores rose slowly over the succeeding days. At day seven after midazolam, mean depression scores had returned to baseline. On the other hand, the mean depression score after ketamine was 15 at day seven, still significantly below the baseline level. Feder and colleagues reported that dissociative symptoms were the main psychiatric adverse effects associated with ketamine, which peaked 40 minutes after dosing and were no longer detectable at the 2-hour mark. However, one patient abruptly quit the study after receiving ketamine during the second infusion, apparently due to dissociative effects. “No emergence of significant psychotic or manic symptoms was observed,” the researchers wrote. Three patients needed beta-blockers to control blood pressure spikes during ketamine infusion. Other adverse effects seen during the first day that were more common with ketamine included blurred vision, dry mouth, restlessness, nausea and vomiting, and poor coordination. The researchers said ketamine‘s precise mechanism of action for reducing PTSD symptoms was unknown. The drug antagonizes glutamate NMDA receptors; glutamate is believed to play a role in forming memories, including those of traumatic events. Thus, it is possible that the drug somehow disrupts the persistent fear and stress associated with such memories. Ketamine also has effects at the cellular level, boosting synaptic connections in the prefrontal cortex in rats, for example. “If [the NMDA receptor] is involved in PTSD, that might suggest trials of other NMDA receptor antagonists, like memantine or dextromethorphan,” Schulz said. Garlow said that drug companies have been looking at novel ketamine-like agents with “good bioavailability and less intoxicating properties,” as well as formulations that don’t require IV infusion. Feder and colleagues acknowledged several limitations to the study: the small sample, the smaller number who received both infusions, and the lack of data on repeated dosing and potential interactions with other medications.